Sustainability and internationalization are considered to be core values of Higher Education Institutions (HEIs), but their relationship is rarely investigated. The current study develops a framework to create a sustainable internationalization policy for an HEI; it analyzes how to measure the sustainability of an internationalization policy in two steps. First, this study presents a theoretical framework for a cost-benefit analysis of HEIs’ sustainable internationalization policies using three sustainability pillars (economic, ecological, and social), each with examples for their own measurable indicators. Second, this research operationalizes the economic pillar of the framework to enable a specific measurement of the economic sustainability of internationalization. The empirical analysis identifies the distribution of funding for internationalization as a promising indicator. To demonstrate the implementation of this part of the framework, this study analyzes how German HEIs distribute their monetary investments in internationalization activities to countries worldwide. Using data from the German academic exchange service (DAAD), this research investigates the distribution using descriptive statistics. In a second step, the methodology of the Lorenz curve is empirically applied to the distribution of funding. Universität Hamburg is used as a case study to visualize the different funding tendencies among German HEIs. The findings suggest that the distribution of resources for internationalization says more about the sustainable character of an HEI than the absolute amount of invested resources. To evaluate the sustainability of an HEI’s internationalization strategy, it is therefore necessary to look at the distribution of target countries in addition to the mere absolute level of funding. 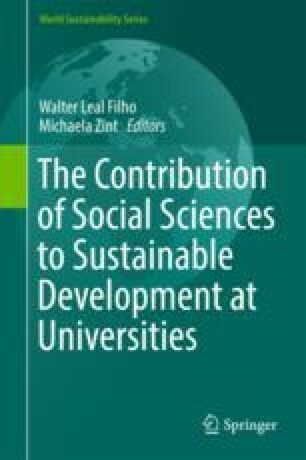 The authors are members of the Postdoc-Kolleg Sustainable Future, a postdoctoral research group at the Centre for a Sustainable University (KNU) at Universität Hamburg.